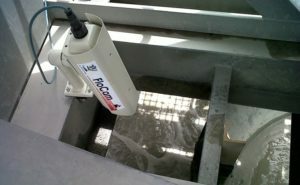 The FloCam system is a low-cost visual froth monitoring camera system that provides users with the capability of monitoring the flotation circuit from a remote location. The FloCam system is able to provide an indication of the concentrate flow or no-flow conditions on individual flotation cells. This provides operators with an efficient tool to remotely monitor the flotation circuit and be alerted to the reduced flow conditions so that the necessary corrective action can be taken. When integrated with the FloatStar Flow/Grade-Recovery Optimiser control system, the controller is able to automatically make adjustments to the concentrate flow from individual cells to correct instances of no flow thus improving overall metallurgical efficiency of the flotation circuit. The FloCam system is also able to provide froth velocity measurements that can be used to balance the froth velocity and pulling rates in a train of flotation cells. Provides a low cost means of monitoring the entire flotation circuit. Intuitive customised interface for manual monitoring. Can be easily integrated into the Mintek FloatStar Flow/Grade-Recovery Optimiser control system to automatically compensate for changes in the mass pull through a reduction in the occurrence of diminished flow conditions observed on the flotation cells thus ensuring minimal mineral losses. A reduction in the occurrence of diminished flow of up to 40 % can be achieved through the effective implementation and use of the system. The availability of froth velocity measurements will enable metallurgists to make qualitative decisions on optimising the mass pull rates from the cells. Has a robust, non-intrusive and flexible structure that can be easily installed on flotation cells.